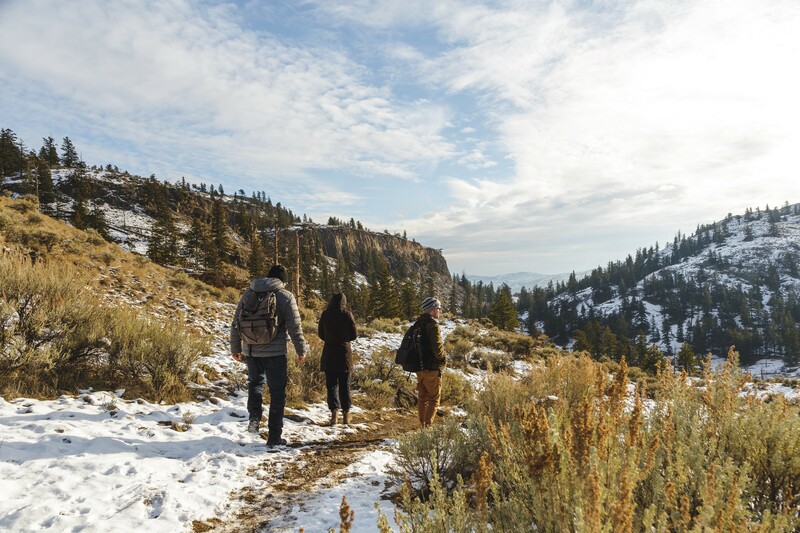 Kicking up frozen bits of dirt and snow beneath our tires, our group of four traversed through the vast wide open, and snow-covered Dewdrop Range headed for a dug-out lot, the vehicular basecamp for the Battle Bluff trail. Jake Dogterom doing a last minute gear check in front of Tyrel’s sky blue Jeep Cherokee in the heart of the Dewdrop Range. Minimal sunlight from the cover of the Southern bluff had kept a light blanket of the snow on the grassland range as we closed the distance between the lot and the smooth start up the first ridge, all the while we laughed about how we’ve never hiked the 4.8km Bluff trail more prepared in all our years living in Kamloops. We counted ourselves lucky that ice hadn’t settled onto the shaded pathway of which we started up. The snow-covered trail hides between the two tree-lined ridges, barely seeing sunlight in the winter months. I could feel the snow crunching under my boots as I treaded lightly up and through the natural pass on account of seven new stitches in the ball of my left foot. Views of the neighbouring sun-soaked plateaus open up a couple of kilometres into the Battle Bluff trail. It wasn’t long at all before we escaped the cover of the trees, leaving the ridge for a broad open view of the lake and the rolling bluffs of the area. In the distance, Jake spotted a heard of resident mountain sheep resting with the desert sagebrush, far enough from our path that we wouldn’t disturb them, nor would they disrupt us. 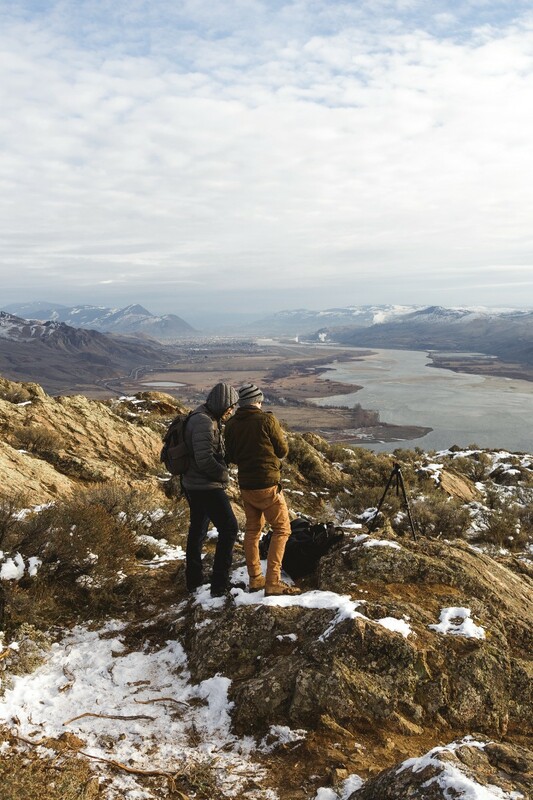 We decided to take a few minutes to catch our breaths and capture the landscape that unfolded in front of us in every direction. Starting down the ridge to an old formation of power lines, Tyrel addressed the mountain towering just south of us, the sun hanging just above its summit. The three of us laughed with our companion, Miguel’s reaction to the trail starting up the rocky bluff ahead of us. 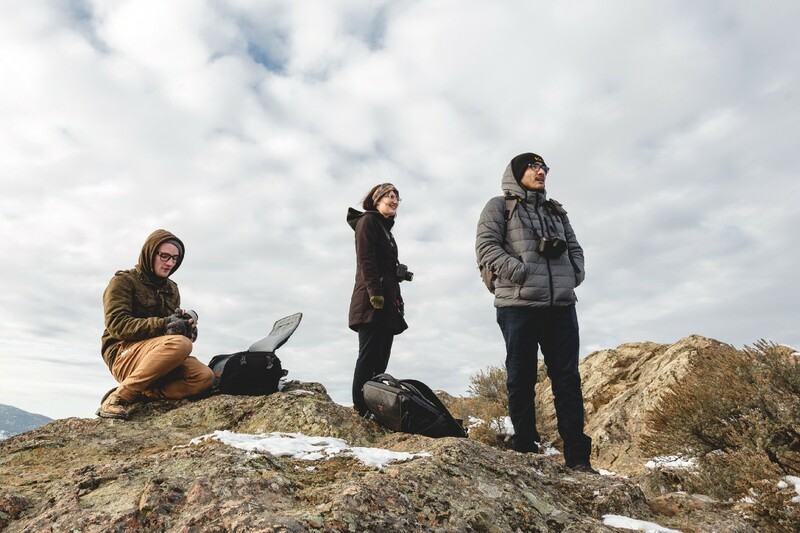 (From left to right) Miguel Valentin, Jake Dogterom and Tyrel Rose taking in the settling winter views of Kamloops Lake below us. Our group hadn’t entirely eluded the ice as the trail serpentined up the mountain to our final viewpoint. Some slow, shallow steps and a few close calls on patches of sleek ice got us closer to the top of the Bluffs trail. Tyrel and Miguel jaunted ahead while Jake and I stayed back to chat photography gear and caught up on the year since we’d hiked together last. We caught up to our bewildered companions who had found the trails guestbook enclosed in a freezer bag among the rocks of the memorial mound created for a since-passed community member that frequented the path. 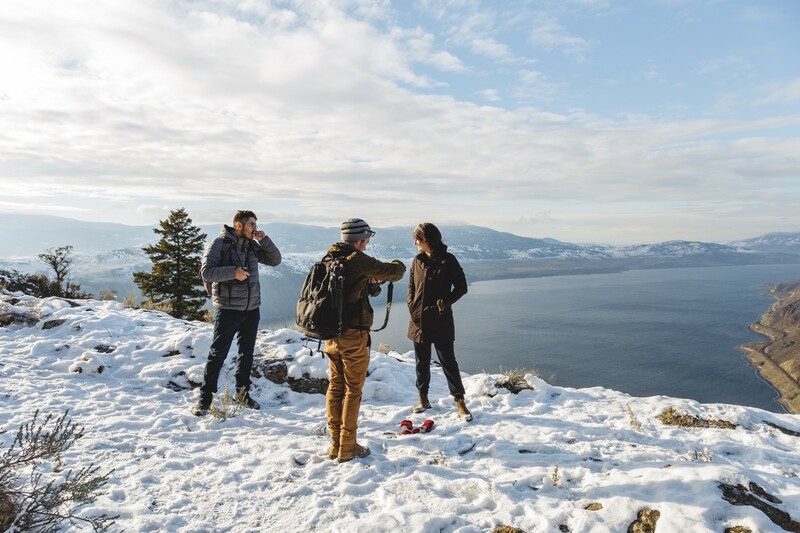 A full 360-degree vantage point is offered at the summit of the bluffs looking over Kamloops lake and area. The wind coming off the 29km long lake down below couldn’t stop us from taking in the blue-toned views of the snow-covered Thompson region laid out in front of us in all directions. In the sky above us floated a pair of eagles, stark against the grey clouds and patches of blue sky. It wouldn’t have been long before the short winter day brought the sun towards the horizon, offering an opportunity to witness one of the areas most acclaimed sunset locations, but cold hands and ears had us starting back down the trail towards home. 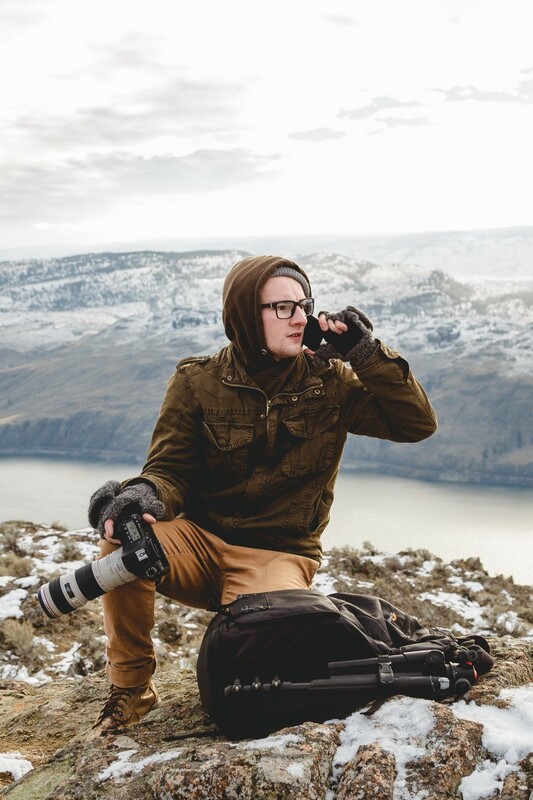 Adventures around the Kamloops area wouldn’t be as grand without the collaboration and creative talent of the individuals featured in this blog. Links to their Instagram pages have been linked below as well as my own.